Composer/lyricist Adam Guettel and librettist Craig Lucas have been developing their musical, THE LIGHT IN THE PIAZZA, for several years. (See Vol. 11, No. 1, and No. 3). From Sundance to Seattle to Chicago, the musical based on the novella by Elizabeth Spencer has undergone a journey as moving and exhilarating as that experienced by two of its leading characters on their transformative visit to Florence. In April, PIAZZA arrived on Broadway, sumptuously produced by Lincoln Center Theater, directed by Bartlett Sher. The New York Times said it was an ambitious new show that reaches for the sky, Associated Press declared it the most melodic and emotionally satisfying musical this season, and New York Magazine called it a must-see, original and daring. The New York Observer hailed THE LIGHT IN THE PIAZZA as a work of such consummate beauty, truth, energy and accomplishment that you leave the theatre filled with joy and revived by hope for the future. Singled out for special praise was the score, and its composer. Adam Guettel, the most gifted and promising theater composer of his generation, is back, and better than ever, cheered the Wall Street Journal. The New York Observer called his score the most gorgeous I have heard in many seasons, the New York Daily News agreed that it was the best musical score in years, and the New York Times declared it the most intensely romantic score of any Broadway musical since WEST SIDE STORY. The original Broadway cast recording was released by Nonesuch Records in May; here, reprinted with his kind permission, are the liner notes by Frank Rich. When Adam Guettel was born in December, 1964, his grandfather, Richard Rodgers, and his mentor-to-be, Stephen Sondheim, were deep in preparation for the Broadway opening, just three months later, of what would be their only collaboration: the musical DO I HEAR A WALTZ? It was not a happy experience for either man, and the show was not a success. And yet you have to wonder what seeds were sown. Adapted from Arthur Laurents 1952 play THE TIME OF THE CUCKOO, the musical told the story of an emotionally stalled American woman who, against all odds, opens herself up to the possibilities of love during a visit to Venice. Forty years later this same theme turns up, with variations, as the core of Guettels new musical, THE LIGHT IN THE PIAZZA. Such is the ravishing power of this piece you almost feel that he was compelled to return to the time of his birth, to that unfulfilled collaboration of his artistic ancestors, so he could retrieve the reins of the classic American musical and get it back on track. THE LIGHT IN THE PIAZZA is a wondrous fable that is as simple and complicated as its ineffable subject, love. Its setting is Italy, summer, 1953. A well-off, middle-aged woman from Winston-Salem, Margaret Johnson (Victoria Clark), has been dutifully dragging her twenty-something daughter, Clara (Kelli OHara), to all the sights, Baedeker in hand. In a square in Florence, a breeze separates Clara from her hat, which is promptly rescued by a handsome young man, Fabrizio (Matthew Morrison). Clara has a secret that would seem to make romance an unlikely, perhaps even dangerous proposition. Fabrizio, who works in his fathers tie shop by the Arno River, seems barely past boyhood and speaks little English. How this young couple overcomes these obstacles and how Claras mother is liberated from her own disappointments in love and life by her childs unexpected rapture is the shows drama and the only drama it needs. The musicals book, written with characteristic empathy and humor by the playwright Craig Lucas, has been adapted from a novella by the American writer Elizabeth Spencer that has never been out of print since it was first published in The New Yorker in 1960. (It was also made into a Hollywood film, starring Olivia de Havilland as the mother, in 1962.) Spencers vision of Italy, in which invading Americans attempt to negotiate the Old World with fixed ideas and mixed results, overlaps with that of Henry James but is remade by her astringent, no-nonsense Southern candor and by historical circumstance. PIAZZA unfolds in the midst of the Italian miracle, when the Marshall plan and tourist dollars like the Johnsons are lifting a society out of its fascist shadows and its defeat in the war. This is the Italy of Anita Ekberg and early Fellini and De Sica, of mythic American interlopers both real (Tennessee Williams) and imagined (Patricia Highsmiths talented Mr. Ripley). Its a culture in flux and a far cry from the nave, rather self-satisfied 1950s America of the Johnsons suburban upper-middle class. 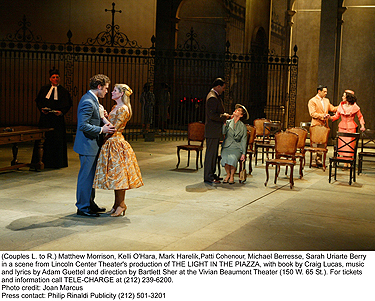 In the Lincoln Center Theater production, the staging by Bartlett Sher and production design by Michael Yeargan (sets), Catherine Zuber (costumes), and Christopher Akerlind (lighting), turn Italy, with all its voluptuous mysteries, both de Chiricoesque modern and ecclesiastical antique, into a major character in the show. In his previous works, Guettel has pursued a vein so specifically American that its hard to picture him in Firenze. FLOYD COLLINS (1996), true to its real-life tale of a Kentucky man who was trapped in a cave in 1925, is saturated with Southern folk influences even as it for the first time sets out the distinctive dimensions of Guettels own plaintive voice. The song cycle MYTHS AND HYMNS (1999) acknowledges the spare classicism of 19th century New England hymnals even as it draws on the musical vocabulary of contemporary American pop. There is no Americana in THE LIGHT IN THE PIAZZA. A few sweet bows to various Italian musical idioms notwithstanding, this is a score tied to no place or time; it aspires to leave behind such diurnal specifics and soar to the realm of pure emotion. In that, it echoes Clara and Fabrizio, who can only come together if they find a language of love that transcends all cultural, social, and linguistic barriers. As Fabrizios father says of the couple in Spencers novella, They are in the time of life when each touch, each look, each sigh rises from the heart, the heart alone. This is what Guettel captures in his music. Its indisputably Richard Rodgers territory, but if the feelings here can run as deep as those in the undying Rodgers love songs, the vulnerable romanticism in PIAZZA is unmistakably Guettels own. Almost as if he were conducting an unconscious dialectic with NO STRINGS (1962), another late, post-Hammerstein Rodgers musical about Americans seeking love on the continent in the 1950s, the PIAZZA score is almost all strings. From the first ethereal bar of the overture there is a shimmer and reach to the melodies that breaks through the traditional boundaries of the Broadway number. Its as if Guettel were determined to capture the golden light of Tuscany in a bottle. The title song sung by Clara in Act II, when Fabrizio and the possibility of happiness seem fatally out of reach just keeps surging and surging into the heaven that so transfixed the Guettel of MYTHS AND HYMNS. 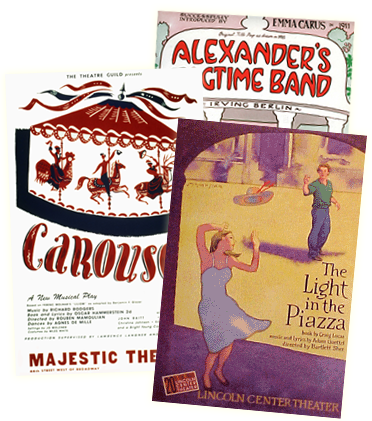 In its dramatic placement, melodic beauty, and evocation of the sensation of sheer youthful yearning, there is not much in the American musical that can match it, unless its the ballet by the fatherless daughter, Louise, danced in part to the strains of If I Loved You in Act II of CAROUSEL. Such is the expressiveness of the music that the shows Italian passages require no translation to be understood. But Guettels lyrics are remarkable as well. Now is I am happiness, sings Fabrizio as he tries to muster any English he can to convey his joy to and for Clara. Never I am unhappiness / Now is I am happiness with you. The song is called Passeggiata, and it takes the form of a jaunty promenade as the young man proudly invites the American girl he loves at first sight to walk with me in the place that I know. Rarely has inarticulateness been so articulate. His innocence protects him like magic, wrote Spencer of Fabrizio and its just that direct, uncalculated pureness of spirit that emerges through the boys broken syntax and makes us fall in love with him too. Yet its essential to both Fabrizios character and the character of the entire musical that at a certain point words disappear entirely, in this song and others, to be supplanted by gorgeous arias that are all music, as if lovers hearts really were in their throats. Love! Love! Love if you can, oh my Clara, sings the girls mother as the story reaches its moving denouement. Love if you can and be loved. It says everything about the brilliance of THE LIGHT IN THE PIAZZA that this sentiment, not exactly a new one in the history of the musical theater, emerges here as a stunning revelation, in all its innocence and all its passion, as if no one had ever thought of singing about it before. This article 2005 by Frank Rich. All Rights Reserved. Used by Permission....THE LIGHT IN THE PIAZZA is currently playing at Lincoln Center Theaters Vivian Beaumont Theater (www.lct.org)... The original Broadway cast recording is now avail- able from Nonesuch Records (www.nonesuch.com)... R&H Theatricals (www.rnhtheatricals.com) is proud to represent the stock and amateur performance rights to PIAZZA; stay tuned for further updates on availability.